The coastal road toward Mandraki branches there and ascend through a dirt covered and easy road towards the Nunnery of the Saint Nikolaos. The route is around one hour. At the start the Nunnery was a male monastery, established at 1675 from an unknown monk.It is located at the Mt. Obori and is one kilometer from the Monastery of Holy Triad. The church is of Byzantine style with an octagonal dome and the sacred images of the newly made wooden iconostasis, are old and of great Byzantine art from the 17th century. 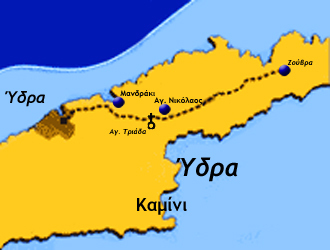 The route from the beach of Hydra to the Monastery is 55 minutes at most. 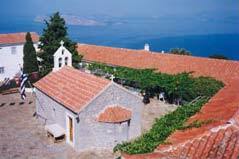 The Monastery of Agia Triada is built to the top of the mountain. 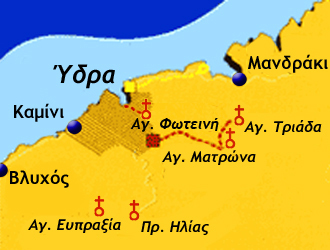 The construction of the monastery is determined in 1704 by the founder, the priest Antonio Economou. Antonios left his entire fortune to the monastery of the Holy Trinity in his will in 1736. 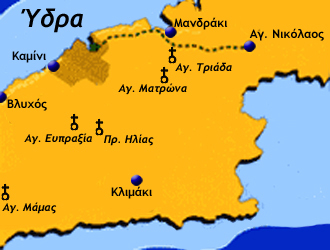 During the Greek revolution of 1821, the Monastery of the Holy Trinity gave financial support to struggling Greeks. 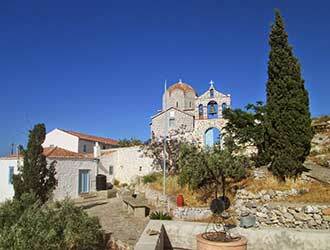 In 1825, Tsamis Karatassos fortified the monastery to repel any invasion. The monastery complex has the characteristics of any orthodox type monasteries, with Byzantine style church in the middle and around the building complexes, with an arch entrance, garden, buildings with dining room, library, cells, guest house etc. The images of the temple probably have been painted by Hydra painter Karatzas. 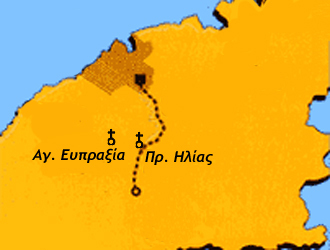 The route from the beach of Hydra to the Monasery of Holy Trinity is 40 minutes. 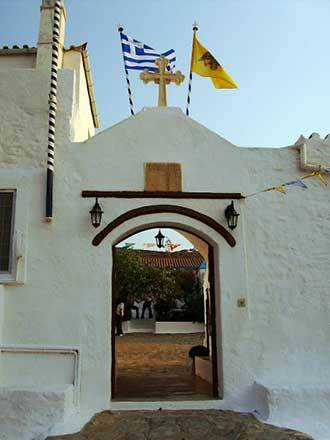 Following the first street from the port yoy reach the Monasery of Agia Fotini. From there we follow a dirt road and reach a branch, the first branch lead to the Monastery of Agia Matrona. The Holy Monasery of Agia Matrona is only 15 minutes away from the Monasery of Holy trinity, is for women only and celebrates on the 20th of October. Its owner was Chrisanthos Karatzas in 1865. 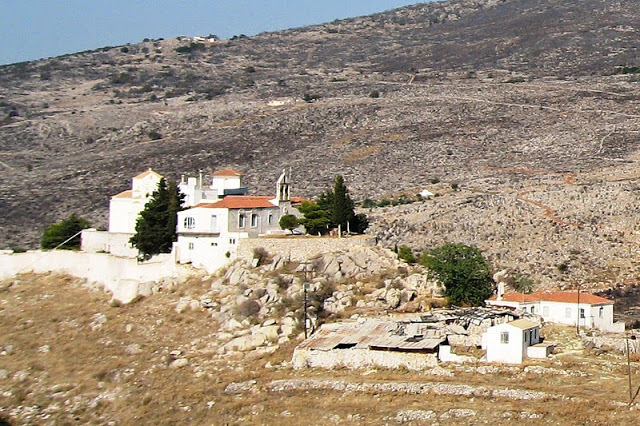 On the eastern edge of the historic island of Hydra and the barren rocky plateau of Upper Zourva, is isolated, the Holy Monastery of the Nativity of the Virgin. Treading the path Hydra - Agios Nikolaos and continuing the dirt path we find many stone ruined houses, in which lived herders until the last century. The road crosses the foothills of Mount Ompori (506 meters), which means "sheep station." Up to the Monastery of Zourva we find two dry rivers and many chapels built in the 18th century, now recently renovated. Some of them are Agia Paraskevi, Prophet Elijah and St. George. The Church of the Monastery of the genesis of the Virgin, probably built in the late 18th century. 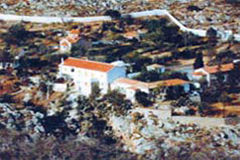 The Hydra writer George Sahinis says that talking with the renovator and founder of today's women's Monastery, the spiritual elder Daniel Siako, informed that the sacred image of the Virgin was found in year 1776 in a cave on the estate of Eleftherios Giannikas, who founded the Monasery. Today the Holy Image is in the Catholic Holy Monastery and has been masked by silver leaf and gold. The transportation is done by boat or water taxi, when the weather allows. The trip takes around 45 minutes. From the harbor Lediza, the climb takes about 45 minutes and becomes a narrow alley of a rough path, slowly and stops. Starting from the Church of the Patron Saint of the island, St. Constantine of Hydra we follow the steep path leading to the monastery of Prophet Elias, in around 60 minutes, which was founded in 1813 by Mount Athos 'Kollyvades' fathers, in place of a small cluster of monasteries, which was a dependency of I. M. Panagia Faneromeni Hydra. On the way we meet a beautiful pine forest and in the area of "Palaion kalograion", an old nunnery. On the way there are benches to relax and enjoy the unique view. From a point on, the path is cobbled with stairs that leads to the monastery gate. The Monastery of Agia Efpraxia located near the Monastery of Prophet Elias at an altitude of about 500 meters with wonderful views, among pines and cypresses. Is made of stone, it was established in 1819 and was from the start a nunnery. 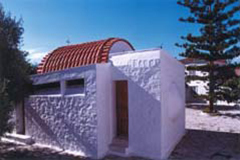 The small temple was built in 1829 by Fr. Ierotheos Doko, who dedicated the monastery in St. Efpraxia. The monastery was famous for obedience, spirituality and diligence of female monks in it. Their textiles were famous. 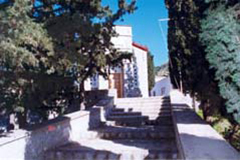 On the beach, the first road (in Alphabank) left, after the flying dolphin, leads the basketball court of Hydra and then at the pine-covered area of the Monastery of Agia Fotini. 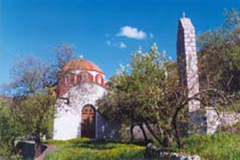 In 1860, P. Chatzikonstantakis Anthimos, a monk of the Monastery of Prophet Elias, bought the small church of Agia Fotini, inside a farm with fruit trees, and founded a small women monastery. Today the Monasery counts only two Nuns, beyond the religious and devotional duties, they are working zealously for the maintenance and landscaping of the monastery.